In my half Italian-American family we always ate spaghetti and meatballs on Sundays. It was my dad's favorite and my mom learned hers from her Italian relatives, of course. They hailed from the South of Italy so it was similar to this recipe- a smooth and velvety red sauce that drenches the pasta and makes you feel all warm and fuzzy. It's not super complicated, it's not fussy, and it might not even be considered real Italian by some, but rather the kind of hybrid dish synonymous with Italian immigrants in America and served all over in "Italian" restaurants. But those are usually not that good. This one, I can attest, is really, really good. It's not often that I lift a recipe, word for word, from a magazine and make it in my kitchen and then post about it. Granted, I read food magazines a lot and like to try out new recipes all the time. I usually like to tweak them, however, to fit my tastes, or combine several recipes, or sometimes just use something I see for inspiration and create something totally new. But this one was so good and so perfect just the way it is, I had no need to change it and really just wanted to share it with everyone. 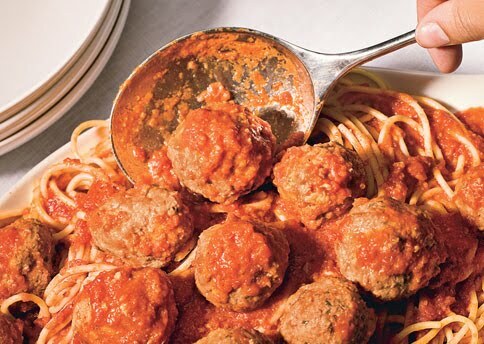 You need to make this spaghetti and meatballs recipe. Now. I don't care if you've been making the same 'gravy' and meatballs your mom or your nonna have made for the last 40 years. I don't care if you make a sauce that simmers all day on the stove because you think that makes it taste better. And I don't care how many pasta sauces you've perfected over the last twenty years of traveling to Italy (that last one was for me). This sauce and these meatballs are perfection on a Sunday afternoon in the fall when you have other things to do besides slave over the stove. It's quick, it's easy and it is so deliciously satisfying. Serve it to your family, to your neighbors, make it for your dinner share or your kid's birthday. This recipe is so family-friendly (I can't believe I'm writing that, but hey, I'm starting to think that way now, I can't help it). Besides, it's Molly Wizenberg's from her "Cooking Life" column, which I love, and she knows a thing or two about comfort food. And for me to go all Italian-American on you like this is really unheard of. So take advantage of my light-hearted and forgiving mood and get over to bonappetit.com --or even better, buy this month's magazine so you can have it forever-- and MAKE THIS RECIPE!